I was born into the world of Christianity. my parents were saved, most of my influential family members were saved. We went to church on Sunday, observed the holidays in view of God’s purpose in it – as best as it was taught to us. So the importance of all these things seems to have afforded me a foundation, right? I’ve been reading Nehemiah. Chapters 8 – 10 are eye opening in relation to these things. Obviously, a blog post doesn’t afford to print out these chapters word for word. I rely upon your own seeking to read these for context. The basics here is this: God started a church here. Just look at all these people did, their commitment, their passion, their zeal and. …their JOY! I thought to myself, “I didn’t see that when I was young, and I don’t think my children did either.” It’s a disheartening thought. To be fair to those who served the Lord within the church, pastoral staff, worshipers, teachers, leaders and servers, I’d like to qualify: there are no fingers of blame in this blog. Nor to my family, parents or any other sector of fault finding avenue. There is nothing in my heart or mind following such paths with this. To learn from the past, apply in the present, in order to make a legacy. We must go back and find where our own thoughts, formulated opinions were influenced and formed. We must see where WE, ourselves, went wrong, not the masses, organizations, or institutions. These only have power to influence, not form. Yeshua (Jesus) proves this. After more study, ending up in many other books of the Word, I’ve noticed a huge impact. When I think of conversation that flowed in my own family as a child, and then my own family with my own children. These scriptures are hard. The conclusion I come to is nobody knows how to do this very well. To talk excitedly about how cool God’s Word is, how His ways are so impressive, and trustworthy. To apply this context to everything we see, touch, smell, and do everyday. Somehow entertainment started to take presidence. I remember thinking it was hard, not fun to memorize scripture. Sometimes due to the fact that it was given as a task for punishment. Mostly because there was no context given as joy and application to its meaning in my life, where I was, at the time. Everything stayed on the level of salvation (what can be done for me). There didn’t seem to be more than that. What pleases God, what doesn’t. Yet what brings Him joy, this seemed to be missing. To the mind in my generation, I believe humans in general, but I’ll stick to my generation; What pleases God wasn’t connected to His joy, but rather His appeasement. No one delighted when I did the right thing, they only moved in swiftly when I didn’t. Everything had to be entertaining, this push was started before my generation, but by the Eighties this was epidemic. Worship was the only place I saw joy in church. The music was amazing, the show was fun. God’s Word was the duty part, not the highlight. The teachers had to be dynamic or “gifted” as many put it. I never met a “gifted” Sunday school teacher. No disrespect to them. At that time even school was not really about learning except to the geeks. It was about finding in our peers what was missing at home. So “Sunday school” it seemed to me was the same. The church seemed to be teetering on this brink of ‘stand out’ but acceptably. Set apart was taboo and meant alienation, most of my peers already felt this at home. Alienation from God never occurred to me as the saddress thing. So one can see why appeasing God this way held little appeal. Not that it’s ever held appeal anyway. History again repeats this point. The world slowly invaded my perception of right and wrong. The passion and joy of talking about God and His ways as we walk on the way, sit or rise, etc…this was never introduced to me. I couldn’t give what I never got. The church became the teacher of children. Parents either didn’t know how or were too busy to fit it in. On both I stand guilty as charged. My heart breaks that my passion and joy in the Lord and His ways that I have now, was not there when my kids were young. There are good things my family passed on, faithfulness. I remained steady in my quiet time and church going. I am grateful to God for His grace and mercy in this. Yet now, I watch my children with their children and see that even these aren’t repeated. Life’s heavy burdens keep them down. The church has lost its calling to share, split up and divide and help. Government organizations now have the overwhelming task that God meant His People to provide. Families of origin must be wealthy or they can only simply pray and cry and hurt with those within that struggle so much. Again the passion and joy of sacrifice and serving are lost. While there are programs in churches designed to help, the politics and overwhelming needs stunt it’s progress. It has been lost for too long, now the task is daunting. The me-ism of society is a cancer that has reached the marrow of the body of Christ. Again it’s the Joy and passion of God’s ways that are missing here. How did I find this joy and passion? When my whole being started seeking God in every way, in everything, at all times. Really seeking Him knowing Him. This is today’s speak for seeking Him with all your heart, mind and soul. How I wish I’d have started sooner! Yet, as the Word of God says. ..His timing is perfect. So I must trust. Trust that this is the appointed time for these words, to the eyes that will read them, and perhaps turn faces up to Him to effect what changes He may direct. The above scriptures all have a common theme, and I think much value in gaining passion and joy in the Kingdom of God. It’s an invitation to test, scrutinize, see for yourself that God is good, reliable, His ways work! They more than “work” they are amazing! It’s a joyous invitation, delightful adventure, and full of fulfilment. Do we example and communicate this to people around us? Well, first, we must discover for ourselves the truth of it! I pray if nothing else, curiosity is raised here, perhaps there is something missing, something far more real and attainable in this walk with God than has ever been invited before. 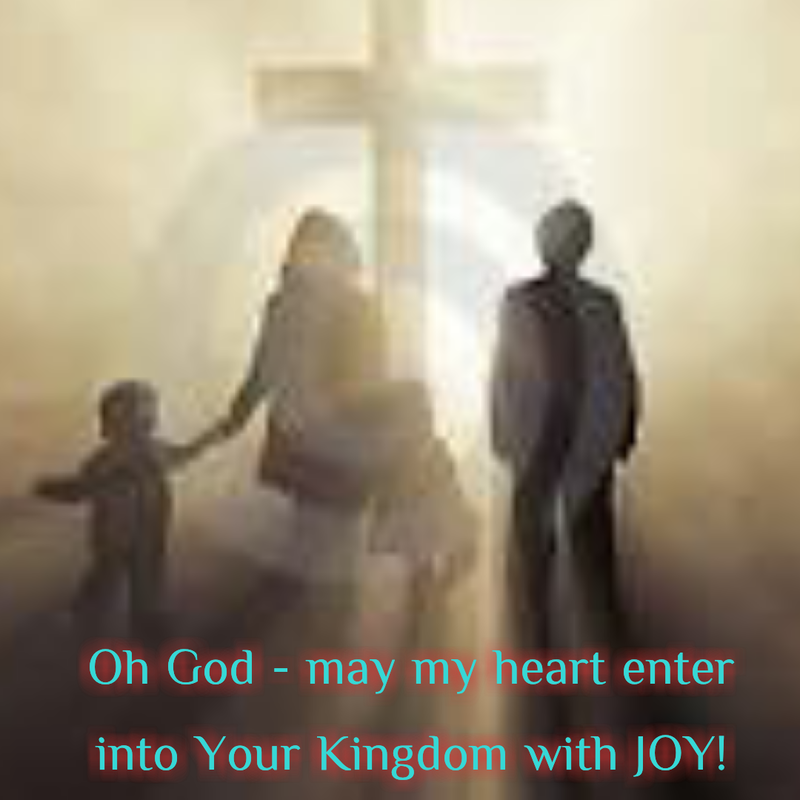 Hear His voice, the One who wants more than anything to be known, put all things before us with the shouting invitation to “Come and see, taste that the Lord is good” so that we can truly teach our children such, truly live such and therefore persuade a neighbor, Co-worker, friend, family member, stranger. ..that this invitation is such a wonder and joy that it’s pursuit will neither drudge nor bore but give passion and joy, such as this world would pale to emulate or try to educate. I pray for our world full of families with children who have children who desire to give them everything. … Adonai, is everything. …come and see!